﻿ theasiancookshop.co.uk – Page 2 – for those passionate about cooking! Method: In a large bowl mix together the tandoori paste, yoghurt, ginger and lemon zest/juice. Fan the chicken breast out and cover in the curry paste. Leave to marinate for at least 30 mins. Cook under a hot grill for 10 mins and then turn and cook for a further 5 mins. Serve hot with sliced onion and lemon slices and tandoori roti or bread of your choice. Great with some Mint Raitha Yoghurt. 8 oz pure gram flour, 1 tbsp rice flour, 1 tbsp sesame seeds, 1 tbs dhana jeera powder, 2 tsp chilli powder, 1/4 tbsp turmeric powder, 1 tbsp salt, 2 large onions, cut in half and sliced finely, 1 tbsp finely chopped coriander, 7 fl oz water, oil for deep frying. 1] sieve the gram flour into a large bowl, then mix in all the remaining dry ingredients together with the onion slices and chopped coriander. 2] gradually add water, mixing thoroughly until a thick batter is formed and the onions are well coated. 3] heat the oil to a depth of 2”-3” in a wok or karahi over a medium heat. To check when the oil is correct temperature and ready to use, trial a drop of the batter – it should rise immediately to the surface without turning brown. 4] now the oil is at the correct temperature you can drop heaped tsp’s of batter into the oil and fry. Place only a few in at a time and do not make them to large, otherwise the centre will not cook through. Turn them if necessary and fry for approx 5 mins until golden brown. 5] repeat until all bhajis are cooked, allowing time for the oil to reheat between each batch. 6] drain excess oil on absorbant paper. Serve. The above recipe is from Virani’s acclaimed cookery book ‘the flavours of gujarat’ and one of my favourites, packed with interesting spices,ingredients and flavours that work well together – especially the sesame seeds! 2] In same oil put chicken, laziza chicken masala [one bag] beaten yoghurt and fry for 5 mins. Add 1-2 cups of water, cover and cook on low flame until meat is tender. 3] Add the crushen fried onion, stir for a while and cook on low flame until ghee/oil seperates from the gravy. Tips:  for an enhanced taste add 1-2 tbsp of fine ginger shreds during step 2.  do not use overburnt or dark brown fried onion. the yoghurt should not be too sour – try a natural plain set yoghurt. 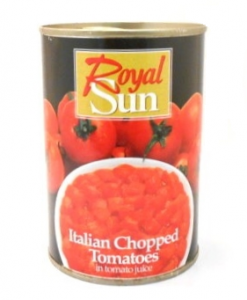 Chopped Tomatoes BUY 1 GET 1 FREE! Check out this great new offer, Just Added. Hello, Welcome to the Asian Cookshop’s Blog. When I opened my first Indian restaurant in 1975, Indian food was not well known and it was quite a job to get diners trying something that must have looked and smelled very different. I think this is where the milder, sweeter curries like Korma and Tikka Masala were invented [or ‘reinvented’ I should say] – delicately spiced, mild, sweet dishes that would prove popular as a gateway into the many ‘spicier’ dishes on offer. Many of my regulars started off with these dishes and then after gaining a little more confidence, quickly moved onto the Bhunas and Madras available. Korma is a dish well known in India and the subcontinent, but it is not as sweet, creamy and ‘mild’ as served here, but commonly a dish quite similar to butter chicken – mild, spiced, flavoursome, less creamy, with butter ghee. As for Masala, the word masala means a blend of spices and so is quite generic for a curry! It is a name used for a curry created in the Uk, and so without a true base to follow from India, they pretty much vary in taste wherever you go. From tomato based curries to yoghurt bases, masala has become synonymous for a milder curry with sauce. Since leaving the trade in 2005, I have been asked a thousand times for good authentic recipes for ‘British Indian Restaurant Style’ curries [BIR], curries that we are used to being served in restaurants and takeaways throughout the Uk. Most are different to what is served in India and you would not get a BIR tikka masala however hard you tried! This is where my ‘U Cook Curry Kits‘ were created as many regulars would ask me for ingredients and recipes to cook at home, rather then dine out as they had friends coming round. Back then, ingredients were not as commonly found in supermarkets and the kits proved very popular – developing into what is available now here at the Asian Cookshop. Peel and slice the onions. On a slow heat, warm pan and then add vegetable oil and the sliced onions. Stir and add tej patta and dalchini – Stir and break up onions. Add 1 tbsp ginger garlic paste and stir, then add salt -the salt helps soften onions as well as add flavour. Add cardamom powder, haldi powder, rajah mild curry powder, rajah mixed masala, methi leaf, rajah garam masala, tomato puree and stir in. Add 600ml cold water and stir, then increase to medium heat. Cook for 2 mins and then add masoor dal – cook for 2 mins. Add cubed chicken breast and cook. Once boiling reduce heat, cover and simmer to cook on slow heat [approx 20mins]. Once chicken is cooked, add chilli flake, jaggery goor powder, lemon juice, salt and stir well. Simmer gently uncovered for 5mins on low heat. Serve hot with basmati rice & naan or chapati. Tips: I like the citrus flavour of lemon but you can use tamarind as well. If the curry is too thick you can add a little more water at the lemon juice stage. If you like it thicker you can let it reduce for a further 5 mins uncovered.